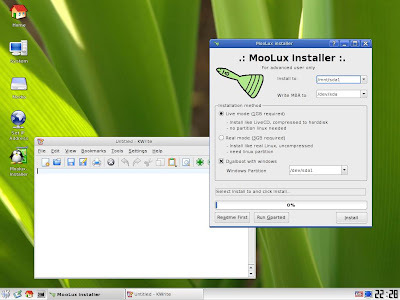 Moolux is a Linux operating system providing wide colection of useful software with Xwindow system and KDE desktop environment. MooLux is designed to be a full system right out of the box. Moolux has all you need USB Disk 1GB. Now we know all you need is not always all you want. Linux is all about choices, right. Moolux can also easily expand using packages from Slackware or other Slackware 3rd party sites. Included in moolux Is a small collection of simple games. These are not meant to impress, they are just a taste of the real fun you can have with MooLux. Try MooLux for full time and see if you are not impressed with this. And if you find anything that needs improvement let we know. See Screenshot here. - PIV or better, Pentium or AMD are both OK.
- No harddisk is required if run Live-USB. This is Very Good explanation for Moolux Thanks.. useful information Thanks..
unbelievable post, really i appreciate it. Thanks a lot for your nice sharing. I like MooLux, Thank you for you good post. Good advice. I'll take it into account. Very well post about moolux . Like your article . You saying is in a clear and right way. This is Very Good clarification for Moolux Thanks.. helpful data Thanks..
You have written very excellent data about Moolux its great to be here. It's Really A Great Post. Thanks a lot for your informative post.Thank you. A handy operating system. That was really interesting. Thanks for the post. Thanks for sharing. I needed this. Wonderful explanation. It's a amazing resource. I gathered lot of information from your blog. Very nice blog about moolux. Thanks for sharing this article. You can find the best casino here all online casinos are good Big win is waiting for you. This information would be very useful. This will also help us to learn more about MooLux. Go through our website of Yealink Phone which will help you to learn more about IP Phones and use MooLux with it. What is web and digital design?